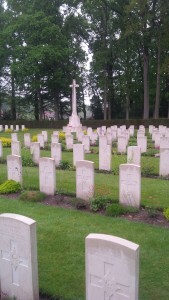 Canadian Battlefields Foundation > CBF Tour Blog EN > Operation Market Garden? After the hard-hitting, fast-paced nine days we’ve spent in Europe (which isn’t including the packed days we had in Ottawa), we actually had a bit of a “break” today, as we were not nearly as busy as we have been. This became a double-edged sword as I found myself wanting more, but really enjoyed the time to myself and spending it with my peers more casually in a foreign city. Today we started out at the Airborne Museum “Hartenstein”, which, in its own way, told the story of Operation “Market Garden” and the subsequent Battle for Arnhem. The museum itself was unique in its own right for a number of its exhibitions, some of which my co-blogger, Sébastien Picard, will pick up on. The museum began with a great background to Market Garden and the validations for it. The maps were particularly useful, especially with experts on the topic on hand to walk us through these maps to get even more out of the experience. 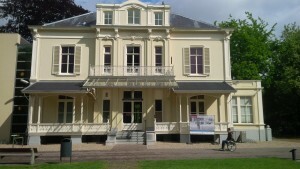 From here we made our way to the Arnhem-Oosterbeek War Cemetery, quite close to the actual museum. In this cemetery, over 1,700 individuals (from Poland, Canada, Britain, Netherlands, Australia, and New Zealand) are buried here, most of which as a result from the Battle of Arnhem from September 1944, but also those killed in the region from September 1944-April 1945. 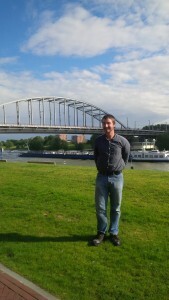 Later on, David Patterson and Geoff Hayes brought us to the “John Frost Brug” (John Frost Bridge), which was only about a 10-15 minute walk from our hotel, where Major General John Frost and his infantry did their absolute best to hold a bridge while waiting for an advancing army that would never come. The sequencing of these excursions shows the thought put into each individual day. Starting off at the museum where we learned from our peer, Deanna Foster, of the background to Market Garden, and then about the operation itself, how it played out, and its aftermath, and then moving to the cemetery, where many of the people we just learned about were buried to finally ending the day at the very bridge that Frost fought so hard to defend, it became a fitting end to a good day. I did catch onto a couple curious differences in the narratives of the operation, and of the Battle of Arnhem more specifically. There seems to be no great consensus towards the role played by Arnhem civilians. Some monuments, plaques, and inscriptions appear to apologise for Arnhem civilians’ premature exuberance during the battle and getting in the way of Allied soldiers. Other such commemorative pieces applaud and encourage the inspirational zeal displayed by these civilians and their attempts to aid the Allied soldiers in whatever way they could. The excitement felt by civilians in the area, seeing not just Allied soldiers, but the culmination of their hopes and dreams for freedom was simply overwhelming as they wished to help in this process any way they could, naturally leading to a disruption in Allied maneuvers, however slight. Furthermore, I would like to express my thoughts on Market Garden as a whole. Prior to today, I had never been completely sold on Montgomery’s “end-the-war-quick” scheme*. Some may consider me unnecessarily cautious (but these are likely the same people who would call the Canadians in the Northwest overly cautious), but the “broad front” strategy encouraged by Eisenhower seemed be the better option. I would like to preface this by stressing that my intention here is not to judge the actions taken by army commanders using seventy years of hindsight to insinuate they had not thought this through. They were very intelligent individuals who had great reasons for doing what they did. I simply do not agree, given the circumstances. In order for the war to end by Christmas 1944, conditions had to be just about perfect for Montgomery’s single thrust strategy to work, leaving way too much up to chance. By attacking the (very long) German line in a single thrust, it simply leaves too much undefended space and open flanks to be effective. Especially with the heavily held and greatly defended German Siegfried Line barely southeast of their position, winning the war by Christmas would be living the dream. While the Allies were suffering from supply issues around September 1944, Montgomery’s conclusion to end the war early seems premature and hasty. This sends such a heavy proportion of their resources to a single region that it deprives those who need them most. If Eisenhower’s strategy were adopted, the front would move slower, yes, but there would be gradual movement, and while this progress was being made, supplies could be moved to the front. By using a single thrust, it requires a heavy allotment of supplies in one region, meaning everywhere else suffers and resources become scarce much quicker, and the only scenario where this works out to their advantage is if it is a resounding success. This is without mentioning the port in Antwerp and progress to be made there. While the Canadians have not taken the Scheldt or Walcheren or surrounding regions, the adoption of the broad front means more time to take and open Antwerp for Allied use, whereas Market Garden is a one-time thrust and hope for the best. 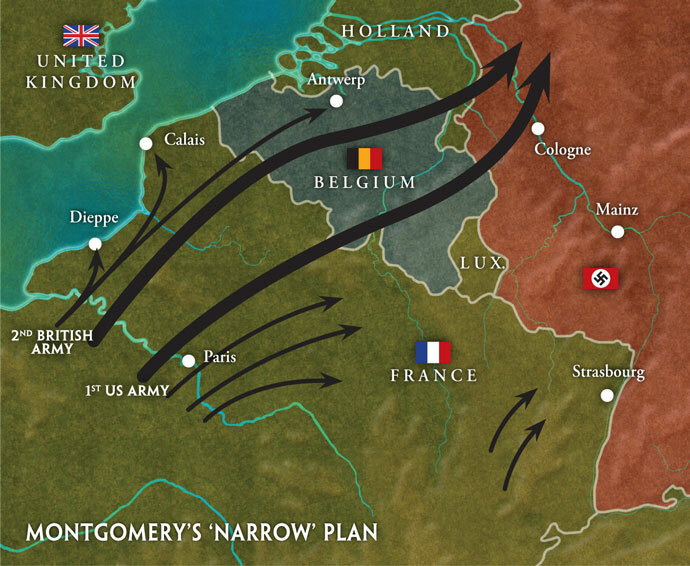 The most convincing argument I have so far heard in support of Montgomery’s theory has been the Allied attempt to avoid the German Siegfried Line, bypassing it by going above it and pushing in from the north. While this is fairly convincing, I do not believe it holds up to everything going against it. The sheer weight in distance that must be covered in order to do this is simply incredible. And not only take this land, but hold it. I would love for someone to convince me of Montgomery’s strategy in the event I am missing some crucial pieces of information. Finally, to end the day, and relieve everyone of that discussion, we stopped at the Sint Julian pub on the way back from the “John Front Brug”. It was a small pub that never got insanely busy, but the only two bartenders always had something to do, while keeping good conversations with their patrons. Their food was diverse and on par with what you’d expect it to be. The schnitzel was just as good as the schnitzel I ate while in Berlin. The atmosphere was cheerful and people were in good moods, so laughter was had all around. It was a fantastic find by fellow traveller Jessica Ozorak, however random or unintentional it may have been!